Christ Did Put Authority and RULE in His Church! Lipstick is only a minor question that spotlights the BIG POINT — authority and RULE in the Church. It is now vital that we understand which questions are for personal decision, and which are not; and the relation to preserving UNITY. Why should it be so rare to find unity among church members? But what's the connection? Just what does the preservation of unity have to do with the make-up question? Look at the churches of this world. Repeatedly torn asunder in dispute, divided into hundreds of denominations! Haven't you ever wondered why they are so divided — how all this sectarian division came about? Few realize the true reason. The answer is simple: None but God's true Church follows GOD'S WAY of preserving that blessed harmony. The world's churches have followed the ways that have seemed right to the natural mind. And these same ways will seem right to you, today, unless you heed what God reveals! "Here's the way I see it: No man or board of ministers has any right to tell me, as an individual member, what I must or must not do. We each stand alone before God. I think the way to preserve unity is simply to follow the basic command to love your neighbor as yourself. If we have LOVE, each may do what is right in his own eyes, and all the other members will have tolerance. I think the only firm foundation for fellowship is LOVE toward those who believe and act differently — even differently than the ministers believe. "I don't want," this attitude continues, "any ministers telling ME that what I believe or think is wrong. I have just as much right to my views as they have to theirs. They have no right to rob me of free moral agency. When my wife can come to church with lipstick on, and I can work, on the holy days as I please, and keep Pentecost on Monday if that seems right to me, or observe Passover on the 15th instead of the 14th, and encounter not critical disapproval, but LOVE — when the Church recognizes my right to my honest views — when the ministers show LOVE toward us as free individuals with minds of our own and rights of our own, then we will really ENJOY coming to church, and then we shall have peace and UNITY, for real love will always let each of us do as we please, and always will rise above differences." "Isn't this doctrine of Church government dangerous? Isn't my religion a private matter, just between me and God? Should not each individual decide for himself such issues as the right or wrong of make-up, or how to figure the correct day for Pentecost, or whether divorce and remarriage is a sin, according to the way he, individually, sees it? If I have to let the Church, thru its ministers, rule me, doesn't that rob me of free moral agency?" These opinions express the natural attitude and reasoning of the human mind. These opinions and questions deserve an answer, based on the BIBLE. First of all, tho you might not have thought of it in this light, this is the identical concept held by those who argue that it makes no difference which day we observe as the Sabbath. From your own reasoning, apart from the Biblical revelation, you would never be able to see whether it makes any difference which DAY is observed — or whether any is observed. "Oh, but that's different," some will say. "The Bible commands us to keep the seventh day, but I can't see where it condemns lipstick." But thousands say: "I can't see where the Bible commands me to keep the Sabbath." Millions think the Bible says the law is done away. What's WRONG with this concept outlined above? Let's summarize the whole reasoning. It simmers down to the idea that each individual must be free to decide for himself what is right, or what is wrong, for him. It all revolves around a false idea of what constitutes free moral agency. This reasoning proposes that each member of God's Church, in order not to be robbed of free moral agency, must be free to decide for himself what constitutes SIN — and every other member is supposed to have tolerance for his belief and way of conduct. This attitude resents having God's ministers show the people their sins, and wants them to preach the soft and smooth things. But what IS free moral agency, anyway? Free moral agency means God has decreed that the individual is free to decide for himself whether he will obey God. GOD ALONE decides what to obey! Surely we all know that sin is the transgression of God's LAW! That Law is a SPIRITUAL Law — a great fundamental law of principles for right living. It must be obeyed "not of the letter [ONLY] but of the Spirit." To break the SPIRIT of the Law, tho perhaps not transgressing the strict letter, is still transgressing the law — IT is SIN! "I think it's all right for me to harbor lustful thoughts after these women, as long as I don't commit any direct act of adultery. The Law doesn't say it's wrong to just LOOK upon her to lust after her, as long as I keep my distance." But Jesus MAGNIFIED this law. According to its SPIRIT — the PRINCIPLE of the Law, He said that such a man has committed adultery with such a woman already in his heart. Now in the same manner, the letter of the Law does not say directly and specifically that cigarette smoking, using make-up, gambling, or many other such things are sinful acts. But the SPIRIT OF THE LAW — the principles it sets forth, and Bible examples, when properly applied, do reveal the right or wrong of every such question. But all individuals do not properly understand or apply the Scriptural principles and examples in the same way. The individual is NOT left free to decide for himself WHAT is sin — but free moral agency allows him to decide WHETHER to sin! It is GOD'S prerogative to tell man WHAT sin is. And when we come to these vague, disputable questions of DEFINING God's Law in respect to sin, it is GOD'S prerogative, not that of the individual, to set the definition. And CHRIST HIMSELF has set up the machinery in His GOVERNMENT in His CHURCH by which HE HIMSELF renders all such decisions for us! A fundamental mission of the Church is to "feed the flock" — to instruct and perfect the members. This I will explain fully, a little later in this article. This very WAY — the idea quoted in the beginning of this article — the way that seemed right to men — the way of every one doing what seemed right in his own eyes, and trying to have love and tolerance for others in the same right — has always CAUSED division, and brought disaster. Look at what has happened! Listen to the lesson of EXPERIENCE! The Church actually began in the days of Moses (Acts 7:38). God placed His GOVERNMENT in that Church of the Old Testament, even as He did in the New. It was the government of GOD, not of man. But God administered it thru human instruments of His choosing. What happened? The people then, like some today, refused to recognize that it was GOD'S government. They regarded it as the dictatorship of MEN — their human leaders. First, God chose Moses and ruled thru him. But you'll read of "this Moses whom they refused, saying, 'Who made thee a RULER and a judge?' The same did GOD send to be RULER." (Acts 7:35). In the time of the Judges, it is written of the congregation of Israel: "Every man did that which was right in his own eyes." (Judges 17:6). But GOD had commanded, just as He who is the SAME today commands today: "Ye shall NOT do after all the things that ye do here this day, every man whatsoever is right in his, own eyes." (Deut. 12:8). Yes, those who do not want GOD'S GOVERNMENT thru His ministers of His choosing, but want to do whatever is right in their own eyes today, actually want to DISOBEY the direct command of GOD! Let them read these Scriptures, and then try to answer GOD in the final judgment! Well later, God chose Samuel. GOD ruled Israel thru Samuel. But the people only looked upon it as the human rule of Samuel, and they rejected him. "And the Eternal said to Samuel... they have not rejected thee, but they have rejected Me, that I should not reign over them." (I Sam. 8:7 ). Finally all Israel was punished in captivity and slavery! And this system of disobeying the DIRECT COMMAND: "Ye shall NOT do... every man whatsoever is right in his own eyes," has split and re-split the churches of this world since Christ. During the first 300 years after Christ, entirely apart from the true Church, more than fifty different professing "Christian" sects appeared. Tho Christ, as we shall see a little later, placed His GOVERNMENT and central authority in His Church, there was no such authority in these sects. They tried this idea of "having LOVE" for those with whom they disagreed. But the DIVINE Love of God-the same Spirit that guides all brethren in GOD'S WAY, into ALL TRUTH — was not the kind of love they had. Their human "love" only divided them in error! It proved no foundation for unity. It brought repeated DIVISION. Then Constantine, Roman Emperor, the prophetic "Beast" of that day, made Christianity (falsely so-called) an official religion of his government. He abolished the sectarianism — forced a united Catholic Church under his dictatorship, put iron rule into the Church. From this the papacy developed. Other sects were exterminated by soldiers and government police. Millions of martyrdoms followed. The true Church of GOD was forced to "flee to the wilderness" to exist. The Church evolved the "primacy of Peter" doctrine. The principle of authoritative government in the Church was God's — but their system of using it was Satan's. It was not GOD'S government, but that of men swayed by Satan. This "primacy of Peter" doctrine on which the papacy is built represents Christ as having said to Peter, in effect: "Peter, I have to leave the earth. I won't be the Head of the Church any longer. I'm making YOU, Peter, the Head of the Church, in my stead. I'm turning all the authority over to you, and those whom men shall elect as your successors. I'm bowing out. You are taking over — taking my place, ruling in my stead." The Roman Catholic Church does not call Christ the present living Head of their Church. That title they give to their pope. So theirs is NOT the government of GOD, thru CHRIST as living HEAD of the Church, ruling thru ministers of His choosing. On the contrary, it is a counterfeit HUMAN government swayed by Satan. Until the time of Luther, this counterfeit Church government, however, did prevent division! The Roman Church continued many centuries undivided. But the system of applying the principle of Church government was all wrong. It ruled by the will of man, Satan-inspired. It preserved unity by physical FORCE. It was the instrument of Satan. Therefore its fruits were EVIL! The Protestant movement failed to correct what was wrong. Because the Catholic government was a counterfeit misrule, they abolished the rule, instead of yielding themselves to the divine government of GOD. They reasoned that every man ought to do what was right in his own eyes. And what resulted? John and Charles Wesley came along and disagreed with Luther on certain points of doctrine. There was no CENTRAL AUTHORITY in the Protestant Church as God's instrument to define the true BIBLE doctrines. The Wesley's were strong leaders. Hundreds, then thousands, followed them like sheep, and a new denomination appeared. Different ideas arose as to whether there should be some kind of limited church government. Some wanted a limited government by the elders and ministers — the presbytery. Others wanted DEMOCRACY — government by the whole congregation. So, in addition to the Lutheran Church following the human Luther, and the Methodists following the Wesleys, the world soon had the Presbyterian and Congregational churches. They went the way that seemed right in their own eyes. But, devout though they were, they had no firm basis for UNITY. They split and re-split, and today we have hundreds of Protestant denominations! The ideas held by a small few in the Church today, enunciated at the beginning of this article, have been put to the test of experience and TIME. And they have proved the very CAUSE of division and confusion. They have not unified the Church members in TRUTH — but divided them in ERROR! Let's let GOD tell us what He means by UNITY. Paul's final word to the Corinthians was this: "Finally, brethren, farewell. Be perfect, be of good comfort, be of one mind, live in peace." Being of ONE MIND is the WAY to peace, and unity. (II Cor. 13:11). "... stand fast in ONE SPIRIT, with ONE MIND, striving together for the faith of the Gospel." (Phil. 1:27;. Fulfill ye my joy, that ye be like-minded, having the same love, being of one accord, of one mind." (Phil. 2:2). Notice how being AGREED and of ONE MIND is continually connected with true LOVE in God's Word! It says nothing about showing love by disagreement. God FORBIDS you to do according to what is right in your own eyes! "Can two walk together, except they be agreed?" (Amos 3:3). "Let this MIND be in you, which was also in Christ Jesus." (Phil. 2:5). Is Christ's mind divided? Two men in the Church at Philippi were in disagreement over some point. In his letter to the church there, Paul gave them a command. He did NOT say, "each of you go ahead believing what is right in your own eyes, and have tolerance toward the other." He rather commanded "that they be of the same mind IN THE LORD." (Phil. 4:2). Notice carefully, not merely of the same mind! Not the same mind in error. Bur IN THE LORD! One person who did not know past history correctly said that years ago, when I was working as a minister with the "Sardis" Church (Rev. 3:1-6) which God says is now "dead" (spiritually), and I did not agree with a few points of doctrine and practice laid down by the ministers, that I did not accept their dictums. But the "Sardis" Church already was spiritually dead, and the time for the "Philadelphia" Church had come. What this person does not know is that on one occasion the leader of the ministers of that Church admitted to me that the Church position on a doctrine in question was wrong, and that I was right — but, he said, the Church would not dare correct its error. On another occasion he admitted to me, in writing (I have the letter), that God had revealed to me a great TRUTH about our national identity as the House of Israel. But neither he nor his Church would accept this TRUTH, even though he privately agreed it was TRUTH! On another occasion this minister asked me to deliberately REJECT truth and light from the Bible, and to preach what lie and ministers in his political control decreed. The one big disagreement that finally severed them totally from being any longer God's living Church, and started the "Philadelphia" Church, was the matter of God's holy days. They rejected this TRUTH. I remained firm in being "of the same mind IN THE LORD," — not apart from the Lord. I state this to set the record straight. God had chosen me and set me in His Church as His Minister. God was using me as His instrument in developing the "Philadelphia" Church. God has set His ministers to lead the people in TRUTH — to tell the people their SINS, which they cannot do unless they are inspired and empowered of God's Spirit to be able, under His guidance, to DETERMINE what is sin, and what is truth. This case of mine has no connection with lay members rejecting TRUTH defined by God thru His Ministers. The true Church will "be of the SAME MIND one toward another," in THE LORD — in His TRUTH, as inspired by His Spirit. (Rom. 12:16). What is God's WAY TO UNITY? "Now I beseech you, brethren, by the name of our Lord Jesus Christ, that ye all speak the same thing, and that there be NO DIVISIONS among you" [speaking different things, having disagreement on these points, MEANS division — not unity]; "but that ye be perfectly joined together IN THE SAME MIND and in the same judgment." (I Cor. 1:10). The Church is to be perfectly joined together — that's UNITY! But HOW? — "in the SAME MIND" — "all speaking the same thing." But it must be the RIGHT thing, and it must be the MIND OF CHRIST! Now, I ask you, brethren, now can this be possible, when different minds see things in different ways. UNLESS GOD HAS PROVIDED A CENTRAL AUTHORITY, DIRECTLY INSPIRED AND LED OF CHRIST, WHICH CAN RIGHTLY APPLY THE PRINCIPLES OF GOD'S LAW IN DOUBTFUL INSTANCES WHERE MINDS LESS MATURE SPIRITUALLY CANNOT CLEARLY AGREE? Did God Himself set any such central AUTHORITY in His Church? We shall see. You shall read it in your own Bible. Not my ideas — but GOD'S WORD! What is the true Church of God? It is that collective body of conquered, Spirit-begotten children of God, in and thru which God, by His Spirit, carries on His mission on earth which He started in and thru the individual human body of Jesus. It has a WORK TO DO. It is the most important work on earth. The Church is God's instrument — His spiritual organism — which He uses to accomplish His purpose on earth for this time. The Church — this BODY OF CHRIST — is composed of many human members, but it is ONE BODY, "fully joined together and compacted." Christ is the living HEAD of His Church, and in Spirit He is IN the Church. He guides it. He governs it! The Church is His organization — its members His staff. He cannot allow disagreement and divisions. A house divided against itself cannot stand. Therefore Christ, of necessity, had to provide A WAY of preventing disagreement and divisions. Unless Christ set up machinery within His Church — a central AUTHORITY thru which HE, the living HEAD of the Church, may settle all differences and reveal all TRUTH, these disagreements which are bound to arise would become a threat to the stability of the Church and the very continuance of GOD'S WORK! Christ did set up just such an authority! Remember, every member starts out as "a babe in Christ." Some have grown to varying degrees of spiritual maturity not yet attained by others. Remember, too, God's Word does not always give an explicit and direct teaching on every point. Some passages are vague, hard to be understood — as Peter wrote that many of Paul's writings are. The unlearned and unstable often wrest these to their own destruction (II Pet. 3:16). Yet bear in mind, with emphasis, it is GOD'S LAW, in His Word, that defines SIN. Not even the Apostle Paul was able to know, of his own mind or reason, apart from the Law, what was right or wrong for him. Man is not allowed to decide, for himself, what is sin. God decides that — and reveals it by His Law. But, as stated above, God's LAW is a great overall LAW OF SPIRITUAL PRINCIPLES! It must be defined, and obeyed, according to its SPIRIT. Its PRINCIPLES must be applied rightly, guided by the Holy Spirit, to many points not literally and specifically covered by its letter! But, again, all members of the Church do not have ability rightly to apply the PRINCIPLES of the Law, aided by Biblical examples, in order to define what is or is not SIN in relation to some of these occasional isolated questions. The very fact of disagreement among members demonstrates this fact. And it is when there is such disagreement — when questions are left undefined by CHRIST'S authority and threaten division in the Body — that the very machinery Christ set within His Church for defining such questions must be put into action. When there is such disagreement among members — as we have already seen in the Church in the question of which day is the Passover — the 14th or the 15th Abib; which day is Pentecost — Monday, or Sunday; is the use of make-up a sin; THEN if individuals are left to decide for themselves, each has decided, for himself, WHAT is or is not SIN! But only GOD can decide and reveal to us WHAT is sin! Therefore it is when such occasions arise that we must resort to THE WAY Christ Himself established by which HE defines what is or is not sin in this matter. The individual member is left a free moral agent to decide WHETHER to accept it and OBEY, or to reject GOD'S LAW, as Christ by HIS WAY in the Church defines it, and to disobey. But every member ought to TREMBLE before such a decision. For "if we SIN WILLFULLY," after God has revealed the knowledge, "there remaineth no more sacrifice for sin, but a certain fearful looking for of judgment and fiery indignation, which shall DEVOUR the adversaries." Such a one automatically puts himself out of God's Church and God's grace. The question becomes, then what machinery, or what central authority, has Christ set up in His Church, by which HE defines for us — by His absolute AUTHORITY — what is or is not SIN in the case of questions not specifically covered by the letter of the Law? To understand, we need to know WHY God has called and chosen ELDERS which He has set in His Church. All ministers, of whatever rank, are elders. An apostle is an elder. A pastor is an elder. An evangelist is an elder. Some elders have higher rank than others. Remember, human minds, material and carnal until conversion, are not made spiritually perfect at once. It is a matter of GROWTH. In this process of spiritual growth, some minds develop in spiritual abilities and knowledge more rapidly than others. Some apply themselves more diligently — study harder — spend more time in prayer and study and meditation. Some have a higher degree of natural ability, greater depth, and God adds spiritual gifts according to our own natural ability (Mat. 25:15). Some have continued this process of spiritual-minded development over a longer span of years than others. Do you realize, brethren, it is these, who are most advanced, SPIRITUALLY. that are spiritually OLDER than the others? They may be younger in physical years. But, spiritually speaking, they are the ELDERS in the Church, because they are spiritually OLDER. And it is these, not only older in spiritual knowledge, but in abilities for the work of the ministry, whom Christ has CHOSEN as His ministers! This is WHY GOD calls them the ELDERS! And it is THESE, who form the central authority, or the instrument within the Church, thru whom CHRIST HIMSELF may REVEAL the true definition of His LAW, and SETTLE such disputes or differences of opinion. God has always had a headquarters Church. In apostolic days it was at Jerusalem. All the other churches and members scattered abroad looked to the apostles and elders at Jerusalem, who were led and directed by Christ, to settle every such doubtful point. You are familiar, of course, with the dispute that arose in the church at Antioch. That disagreement threatened to divide the Church. The question at issue was whether it was right or wrong to do certain things — what kind of conduct was required — whether it was sin — just like this cosmetic question. The headquarters Church at Jerusalem RULED on the question. Their ruling was not their own — they were led in it by the Holy Spirit. It was then no longer a question! It was thereafter BOUND IN HEAVEN! It became the LAW OF GOD. It was so accepted by the Church at Antioch. Had any individual member there disagreed — had any said, "I don't want any ministers at Jerusalem telling me that what I believe or think is wrong. I have just as much right to my views as they have to theirs!" that member would have been resisting the DECISION OF GOD, bound in Heaven, and would have been put out of the Church. Yes, it may be true that the individual member has just as much right to HIS VIEWS as the ministers have to theirs. But when such a decision is rendered, it is NOT the personal views or ideas of the ministers — it is the revealed DECISION OF CHRIST, THE HEAD OF THE CHURCH! It becomes, then, a specific, definite "THUS SAITH THE LORD." The one BIG POINT in your life — that which determines your ETERNITY — is the matter of TOTAL SUBMISSION TO THE AUTHORITY OF GOD! What is it that cuts man off from God? It is REBELLION against God's AUTHORITY! Did God Put GOVERNMENT in His Church? But, if there be any left who still ask the question, DID God put actual government, and RULE, in His Church? — did He actually invest His ministers with authority? or does God rule His children only individually and personally, thru the Bible ALONE, just as each individual sees it for himself? — here is the answer! What about this thing of CHURCH GOVERNMENT? Did GOD put it there? Does GOD command us to be submissive to it? 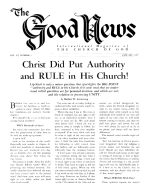 Five or six articles have been published in The GOOD NEWS proving that God did put government in His Church — that God rules us collectively, in and thru the Church, as well as individually. Let's make this PLAIN, once and for all! It is indeed PLAIN in YOUR BIBLE! First, then, in I Corinthians 12, we have the plain instruction about the spiritual gifts God has put within His Church. Verse 4, there are diversities of gifts, for different purposes and functions in the Church. Verse 5: there are differences of administrations. What is an "administration?" It is the office of performing a function, operation, service. It is the GOVERNING, or EXECUTING function. We have our Administration building on the college campus — containing the offices of the executives who direct, manage, govern. When we speak of the Administration at Washington, D.C., we refer to the function of the President. And what is that administrative function? The ENFORCING of the LAWS of the government — laws already made — not the making of laws — the actual governing! So, then, there are ADMINISTRATIONS — or executive, administrative, governing functions IN GOD'S CHURCH! Verse 6: There are diversities of operations. That is, of activities being carried on. Now for the executing of these activities, these various operations, administrations, which become the WORK and ACTIVITY of God's Church, God gives to one the gift of wisdom, to another knowledge, to others, faith, to others gifts of healing, etc.. Does this have anything to do with ruling, or government? Does one need wisdom, to be a wise and just ruler? Does one need knowledge or faith to govern, to judge, to make decisions? Most assuredly he does! Notice verse 18: It is GOD, not man or the vote of members, who sets members in various functions and offices, as it has pleased HIM. All do not have the same office, operation, or administration. But what offices has God set in His Church? "And God hath set some in the Church, first APOSTLES, secondarily prophets, thirdly teachers (including pastors), after that miracles, then gifts of healing, helps, GOVERNMENTS, diversities of tongues." So God did set GOVERNMENTS in His Church. We will demonstrate that abundantly by other texts later. But, are all apostles? No. Are all teachers? No! Have all the gifts of healing? No! Do all sit in office of government? No. God has SET some in His Church to govern. And when you resist that government, YOU DISOBEY GOD, and that disobedience is SIN, the penalty of which is ETERNAL DEATH — loss of salvation! We find these administrative offices also in Ephesians 4. Let's notice it carefully. There is only ONE BODY — one true Church — verse 4. And in that one Church, "HE — GOD — gave some, apostles: and some, prophets: and some, evangelists: and some, pastors, and teachers:" — WHY? What is the function of these offices: "... for the perfecting of the saints," is mentioned first. How can the saints be perfected, if each sees vague and obscure points differently, each goes off a different way, controversy and division separates them and destroys unity and cooperation and LOVE? Can you see the need of UNITY — of discipline? Well, read on! "... for the work of the Ministry," is next mentioned as the function of these offices. The first commission in the work of the ministry is to proclaim the Gospel to the world as a witness. That's a gigantic task. In today's world, with the mass-communication facilities God has made available, it is actually BIG BUSINESS, and it cannot be efficiently operated without organization. And that, in turn, automatically calls for AUTHORITY — one at the top responsible for top-level decisions and policies, others under him as heads of departments, others under them in other supervisory operations. And all this requires government and discipline. Otherwise we would have confusion, utter failure. Also part of the ministry is feeding the flock. This involves local church congregations. Here, also, there must be organization and discipline, or we have confusion. All this is made PLAIN by many other Scriptures we shall come to later. "... for the edifying of the body of Christ," is the next function mentioned. How can apostles, evangelists, pastors, and preaching elders edify, or instruct, the congregations, if we are all divided on which date the Church should meet for Pentecost, or whether lipstick is a sin. or whether physical circumcision is required? If we are all divided, one comes to have one faith, another a different faith, and finally we have hundreds of sects and denominations. But WHY did God set these OFFICERS in His Church? "... TILL we all come in the UNITY of the faith, and of the knowledge of the Son of God, unto a perfect man." Also read Rom. 10:13-17. Yes, there it is — government is in the Church to bring ALL in the Church into UNITY, not into confusion and division. Unity in KNOWLEDGE! The knowledge of the Son of God is CHRIST'S knowledge. Back in Antioch some thought it was CHRIST'S knowledge that all males should be circumcised — others believed that was NOT Christ's true knowledge. The Headquarters Church at Jerusalem settled it, HOW? By taking away free moral agency from those at Antioch? No! By defining, as led by GOD'S SPIRIT, what was Christ's true knowledge. This brought the Church into the UNITY of that knowledge, and saved division. This GOVERNMENT in the Church did not split up the Church — it UNIFIED it! But Do These Officers Bear RULE? But one hard to convince may still say, "Yes, but I don't believe those officers were put in the Church to RULE! I want to see that very word 'RULE' in the Bible, in connection with these officers." All right — you shall see it! Read it in your own Bible! Open your Bible to I Timothy 3-Notice the qualifications for the office of elder, or bishop, as it is here called. The terms elder and bishop are synonymous and interchangeably used in the New Testament. Remember, all these officials God set in His Church are ELDERS. Peter was an elder. Evangelists, pastors — all are elders, or bishops. An elder, or bishop, then, must be (verse 4): "one that RULETH well his own house, having his children in subjection with all gravity, for if a man know not how to RULE his own house, how shall he take care of the Church of God?" That's PLAIN! He must be able to RULE! God makes even plainer what He means by saying, in I Tim. 5:17: "Let the elders that RULE well be counted worthy of double honor, especially those who labor in the WORD and DOCTRINE." That is, those who RULE in questions of the WORD — questions about what the Bible says — and of DOCTRINE — of determining or defining the true MEANING of God's Word — defining DOCTRINE. Notice Romans 12. In the Church are many members, but it is ONE BODY (verse 4). We are one Body in Christ (verse 5). We have various spiritual gifts (verse 6). Like I Cor. 12 and Eph. 4, here is instruction regarding the administrations in the Church. Now, (verse 8): "he that RULETH, with diligence'' In plainest language this says God has set some to RULE in the Church, and they should RULE with diligence! Now look at I Thes. 5:12-13: "And we beseech you, brethren, to know them which labor among you, and are over you in the Lord [bear RULE], and esteem them very highly in love, for their work's sake. And be at peace among yourselves." All of God's true yielded children will do that — the rebellious will not. That is the way to PEACE among ourselves. It is GOD'S WAY! The Epistles of Paul form a large part of the New Testament. They are corrective. They have to do with problems that arose in the Church, which Paul settled with authority. They are administrative letters. In them Paul shows plainly the authority vested in him as God's apostle. These letters of Paul show God's Church GOVERNMENT in action! Notice this Bible command: "I beseech you, brethren, (ye know the house of Stephanas, that it is the first fruits [first converts] of Achaia, and that they have [devoted] themselves to the ministry of the saints), that ye submit yourselves unto such." (I Cor. 16:15-16). Members at Corinth were commanded to SUBMIT to the authority vested in these ministers. Here's the Bible command to Israelites in the Church: "Remember them that have the RULE over you, who have spoken unto you the word of God, whose faith follow." (Heb. 13:7). Then again, "OBEY them that have the RULE over you, and submit yourselves: for they watch for your souls, as they must give account" of their RULE! (Heb. 13:17). In writing to the Church at Corinth, Paul showed his authority in I Cor. 4:18-21: "Now some are puffed up, as though I would not come unto you. But I will come shortly, if the Lord will, and will know, not the speech of them that arc puffed up, but the power. For the Kingdom of God is not in word, but in power. What will ye? shall I come unto you with it rod, or in love, and in the spirit of meekness?" Continuing, 1 Cor. 5:1-2, 13: "It is commonly reported that there is fornication among you, and such fornication as is not so much as named among the Gentiles, that one should have his father's wife. And ye are puffed up, and have not rather mourned, that he that hath done this deed might be taken away from among you. For I, verily, as absent in body, but present in spirit, have judged already, as though I were present, concerning him that hath so done this deed... Therefore put away from among yourselves that wicked person." There, brethren, is God's RULE in action, thru His chosen apostle! Is Jesus Christ THE SAME today? Does Christ RULE in His Church, thru His apostles and ministers in the same manner, TODAY? He does! He's the SAME today! Now brethren, if we are members of the true Church of God, that same authority — that same RULE by CHRIST thru His chosen ministers, is in His Church today. If any do not wish to submit to GOD'S RULE, as God Himself has chosen to administer it — THRU CHRIST — thru His apostle and ministers — then they have not surrendered to GOD and His authority over them — they have not repented — they have not even made the very first step toward conversion, and they certainly are NOT members of the Body, of Christ! II Cor. 10:8: "For though I should boast somewhat more of our AUTHORITY, which the Lord hath given us for edification, and not for your destruction, I should not be ashamed.... But we will not boast of things without our measure, but according to the measure of the RULE which God hath distributed to us, a measure to reach even unto you." Rule of CHRIST — not of Ministers! Brethren, that ought to settle it! Submission to authority is the basic theme of the Bible. You will find it when God first talked to man and instructed him, in Genesis 2. You will find it all thru Genesis and all the books of Moses. You find it as the central thread woven all thru the historic books of the Old Testament. You find it in Psalms, Proverbs and all the poetic books. You find it in all the prophets. You find it the dominant key-note in all that Jesus taught and preached in the four Gospel books. You find it the basic tenet of the Apostle Paul's inspired writings. You find it in James, Peter, John, Jude. You find it woven all thru the Book of Revelation, even unto the last chapter in all the Bible. Voluntary submission to the rule of GOD, coupled with FAITH in Jesus Christ as Saviour — that is the WHOLE duty of this present life, working out the PURPOSE of life, and attaining to our true goal, being born into the Kingdom of God! As you, even as an individual, are called to dedicate yourself to the Christian life, God has provided a two-fold Christian duty in order to develop you and prepare you for The KINGDOM OF GOD. First of all God lays on each of us his part in the Work of GOD — the mission of the Church Secondly, you must, even apart from our collective mission, overcome the world and the self within you, grow in knowledge and grace by continuous Bible study, prayer, and experience, and endure in this way unto the end. But the very first duty of life becomes, for each of us, our united work together with Christ in THE WORK OF GOD — the mission of the Church. In this all-important work, the living CHRIST, as High Priest and HEAD of the Church, is actually IN His Church. Christ directs the work. The Church is His Body — His instrument — His organization. He is its HEAD! Now how could the head of a large business organization run that business and accomplish its objective without RULE? How could the President of the United States run the government of the nation if department heads, or lesser employees in the federal government were allowed to form policies contrary to those set in the government from the top? God is not the author of confusion. In His Body there must be UNITY — absolute accord — teamwork — all working together AS CHRIST DIRECTS AND LEADS. And so God has placed GOVERNMENT in His Church. It is the government of GOD. It is government from the top down. God the Father is at the top. Christ does nothing of Himself — but He acts as the Father commands Him. And Christ, in turn RULES His Church. He rules it, first, thru His own chosen apostles, then next under them in rank thru evangelists, then pastors, then other elders. But it is the rule of CHRIST — not of men. We ministers must submit to Christ's rule, the same as other members. God's ministers are conscious, above all things, of their subjection to Christ's RULE over them. No man may be ordained into God's ministry unless he has shown and demonstrated his surrender to GOD, and to God's RULE over his life and his actions. No man is ever placed in position to GIVE orders which must have come from above, until after he has demonstrated he is willing to take orders. Now how does God's Church, today, actually arrive at a decision and make it a ruling, binding on the whole Church — and BOUND IN HEAVEN? When there was a dispute in the Church at Antioch in the days of the original apostles, the question was settled thru God's Headquarters Church at Jerusalem. But those apostles and elders were mere instruments of CHRIST. Read it again, in the 15th chapter of Acts. Peter, given top rank over other apostles by Christ, actually was the instrument used to indicate the decision. Notice HOW this decision came. Verse 6", the apostles and elders at Jerusalem came together to consider the matter. Verse 7, there was first much "disputing." This should be translated "discussion." The Greek word, used nowhere else in the Bible, is "suzeteses" defined as "a joint seeking." Then Peter rose up. Notice how GOD'S hand is shown: "GOD made' choice among us"... "and GOD... bare them witness, giving them (Gentiles) the Holy Spirit;"... "Now therefore, why tempt ye GOD, to put a yoke upon the neck of the disciples?" Peter pointed only to the will of GOD! Then James, pastor of the Headquarters Church, made the decision official and BINDING on earth, as Peter had made plain it was in heaven. He said: "Simeon (Peter) hath declared how GOD did visit the Gentiles... and to this agree the words of the prophets (appeal to GOD'S Word)... Wherefore my sentence is..." thereupon stating the official decision. When God's apostle and ministers come together today to consider a matter in question, the procedure is the same. First there is the appeal to God to reveal His will, and guide us that the decision will be His, not ours. Then there is the discussion. This is an earnest seeking for the full facts bearing on the question. Quite often, in our own minds, we feel that the decision is going to be just the opposite of what it finally turns out to be, under God's guidance. When we came together to learn and decide whether to continue the policy of establishing grade and high schools, or whether to close up the one then already started at Gladewater, during the first hour or two of the discussion nearly all of us believed the decision was going to be to close up the one school and never establish another. But after adjourning to pray over it further and sleep over it, we came together the next day and it was clearly revealed to all that God has given His Church responsibility to feed the flock — and that this includes the children. In every instance where God's ministers in this Philadelphia era of the Church have come together to make a ruling, our minds have been put in complete accord. There is no voting. But if there were a secret ballot, it would be found that God has led us and made us unanimously of one mind. In no sense do I, as the senior ranking minister, impose any decision of mine on the other ministers. In every instance the decision has been as much their definite conviction as mine. There has never been a dissenting voice — never a doubt in any of our minds in regard to the final decision. This very fact is proof that it is the mind of Christ, thru the Holy Spirit. It is proof that this is GOD'S Church — that it is led, not by the will of men, but RULED and directed by GOD. The final ruling is not ours — IT is GOD'S. Therefore the final ruling becomes a definite, specific "THUS SAITH THE LORD." It becomes LAW! On these questions, such as the use of make-up, where the Bible is sufficiently vague and lacking in direct specific teaching that lay members disagree, God's Headquarters Church DEFINES the Law of God, as it covers this case by the very PRINCIPLE of the Law — by its SPIRIT, where it had not previously been covered by its letter. Once so defined, it becomes a definite, specific "THUS SAITH THE LORD" on the point. Jesus Christ plainly said to His ministers in His Headquarters Church: "Whatsoever thou shalt bind on earth shall be bound in heaven: and whatsoever thou shalt loose on earth shall be loosed in heaven." However, it must be, and is, a ruling that comes actually from Christ, the Head of the Church. CHRIST RULES His CHURCH! It is never a matter of God's ministers deciding what we, as humans, think is right, and then imposing our beliefs or views on the other members. It is a matter of GOD, thru Jesus Christ, leading thru His Holy Spirit those in the Church that are the ELDERS to understand what is GOD'S LAW on the question. It is always the LAW OF GOD, as that Law has existed from the beginning, and as that law applies to the specific question, that is the ruling. That's WHY it is bound in heaven! All that we are led to pronounce and rule in such an event is what has been God's Law on the point from Creation. Is CHRIST Able to Rule? The government in the Church is the government of GOD, thru Christ, the living HEAD of the Church. God's ministers are yielded, submissive to GOD'S will. We ministers know that we serve a dynamic, living, all-powerful supernatural GOD! We fear to disobey, or to fail to be submissive. We know well what would happen to us if we should ever permit self-will to sway us in any decision. CHRIST is the HEAD of this Church, and it is CHRIST'S responsibility, not yours, to use His supernatural miracle-working POWER, if necessary, to see that His decision is faithfully rendered. You don't need to play detective to find out whether we ministers are honest, impartial, wholly submissive to GOD'S will and guidance when we come together to render a decision. That's CHRIST'S responsibility. Do you think He is capable of handling it? We know He is! Christ RULES His Church. He RULES Us! HOW FAR Does Church Rule Extend? Finally, if there still be any suspicious of Christ's ability to rule, or to control His ministers thru whom He rules, such a one might ask: "Well, where is this thing of defining sin, or ruling on such questions, going to stop?" The answer is that it is the function of God's Headquarters Church to render such a definition and ruling only when those questions arise which actually begin to threaten to divide the Church. When that happens, God's ministers have an obligation to meet together and appeal to our Head, Christ, to settle the issue according to His will, before it can spread into actual open division. Brethren, it is because we did not as yet ourselves fully comprehend this working of GOD'S GOVERNMENT in His Church, and because no such authority was exercised in the parent church at Eugene, Oregon, that a division came about which did split the Church there. Several whom we loved and had served in love for years turned bitterly against us and left the Church. THAT MUST NEVER HAPPEN AGAIN. If some one trouble-maker appears, bent on attracting a following and dividing the Church with some wrong doctrine or idea, we shall obey God's Word in the exercise of His government, and mark that person, and, us Paul commanded in I Cor. 5:13, "put away from ourselves that wicked person." Does God's RULE in His Church give ministers authority to intervene even in affairs of the personal life of members! The answer is, YES, but of course rarely. and only in extreme cases where this is necessary. Paul said, "this we commanded you, that if any would not work, neither should they eat. For we hear that there are some which walk among you disorderly, working not at all, but are busybodies." (II Thes. 3:10-11). That is a command that the Church is to command such to work, and if they do not, to take from them all aid given by the Church to help feed them. God's ministers arc required to use wisdom and judgment, and they are never going to interfere in private lives unless there is a BIBLE reason. Where Else Will You Go? If we ministers are not God's own chosen elders in His true Church, and under His control in the administration of His government in the Church, then how do we account for the tremendous FRUITS borne by this work, and the overwhelming BLESSINGS lavished on us by God? One, unhappily no longer in the fellowship of God's begotten children, says: "I agree with all you teach, except in this matter of Church government, and the ruling on lipstick." Well then, do you know of some other Church which believes all these TRUTHS, and is fulfilling the prophecy of Mat. 24:14 carrying out the Commission of Christ to all the world — preaching the TRUTH GOSPEL - where the sick are being miraculously healed — bearing all these FRUITS of the true Church, and which also approves of painted faces and operates without any government? There was a time, during Jesus' earthly ministry, when "many of His disciples went back, and walked no more with Him." Then Jesus turned to His chosen twelve, and said: "Will ye also go away?" "Lord, to whom shall we go? THOU hast the words of eternal life." Yes, to whom, then — or to WHAT CHURCH — shall you go? Where else, today, do you find the words of Eternal Life — the TRUE GOSPEL proclaimed in POWER around the world — the sick being healed, lives being changed and made like God? It does seem to those of us on the INSIDE, enjoying the WARMTH of God's love, and the joys of His blessings, that it must be a mighty dreary, cold, empty, and spiritually LONELY life on the outside — with no place to turn — no other ministers to call as God commands when you or your children are sick — no place but the pagan hostile WORLD to find fellowship! What is it that cuts men off from God? It is REBELLION — and that alone! Rebellion against GOD'S authority! How may such be reconciled to God — restored to His fellowship and that of His CHURCH? By REPENTANCE, and FAITH in CHRIST as Saviour — by praying as David did in the 51st Psalm — asking God very humbly to have mercy and forgive — to renew a right spirit within — to restore the Holy Spirit, and the JOY of God's salvation. Then shall such a one be restored into the fellowship of Christ — and of His CHURCH! May God help every one of us to UNDERSTAND, and to HUMBLE ourselves before God — to remove all wanting our own way — all VANITY and contrary spirit! — and fill us with His Love, that we may enjoy permanently that RARE blessing of dwelling together in UNITY!